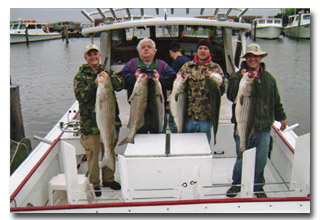 We specialize in family outings, kids’ trips, crabbing charters, birthday parties, bachelor parties, corporate events and much more! We have two boats available. They both have an enclosed bathroom, a dinette to eat your lunch and a roof that comes back 3/4of the way to protect you from the elements. All trips are for 6 passeng3ers or less. Larger parties can be accommodated. To book a trip, a deposit of $100 is to be received within 5-7 days from the date the trip is booked. No deposit – no trip. All trips require at least a 30-day cancellation notice in order to receive a full refund. All trips cancelled within less than 30 days will forfeit the deposit, unless other arrangements have been made with the captain. In cases of inclement weather, the captain reserves the right to cancel any trip. Safety is our #1 priority. If the forecast is calling for severe weather, high winds or a small craft warning, there will likely be a cancellation. The captain will inform you as soon as possible of any chances for a cancelled charter. If your trip is cancelled due to inclement weather or mechanical issues, we will simply reschedule for a future day that season. We do not refund deposits for bad weather. There are too many nice days and the point of taking a charter is to be able to enjoy it. Alcohol is allowed in moderation. No illegal drugs.